Many products are packaged in metal, paper or plastic cups. These can range in size from less than an ounce to a pint or more. They are typically closed with a foil, plastic or paper lid, heat sealed to the cup. Common products include margarine, dipping sauces, potato and egg salads, dry soup, household chemicals, candy, toys and anything else that can fit into a cup. 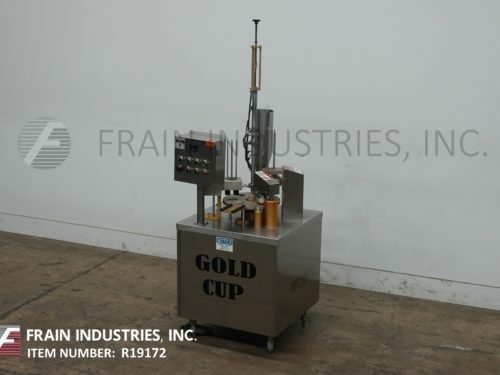 Single head rotary cup fillers are intermittent motion and generally limited to rather low speeds, around 20-40ppm. The turret of the cup filler consists of a plate with holes. The holes are sized and profiled for the specific cup to be filled. Cups and lids are stacked in a magazine ready for dispensing. 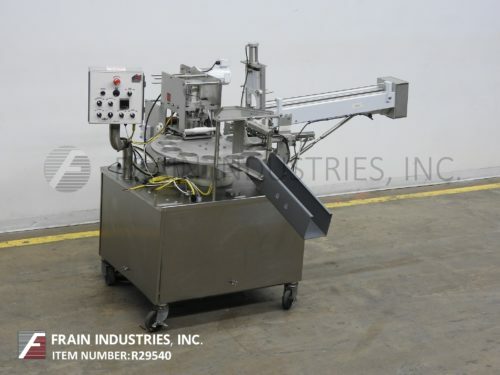 This picture from the Frain website shows the various stations of the filler. This machine is a bit unusual since it has two product hoppers and two filling heads, both filling into the same cup. The first step is indexing an empty station under the cup magazine. The pair of screws dispenses 1 cup which drops into the pocket on the turret. The turret indexes to stage the cup under the filling nozzle. The cup is then filled using piston fillers driven by air cylinders. Fill volume, a function of piston stroke length is controlled by physical stops, set by turning the black adjustment knobs in the picture. After filling the turret indexes to position the cup under the lid dispenser. In the machine shown, there is a blank station where the filled cup is staged for one cycle prior to lid placement. At the lidding station, the lid is pulled from the magazine and placed on the cup. Note in the picture how the cup is recessed slightly and includes a recess to match the tab on the lid. In the final station, a pedestal below the turret pushes the cup up. When the bottom of the cup is flush with the turret, a sweep arm pushes the cup from the turret to the discharge track. The cup is removed by hand or conveyor for further packing.